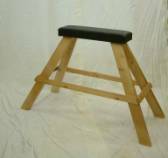 This light weight bench is very sturdy and is easily folded for storage. The wood can be finished in a range of colours. The top can be finished in leather (studded) or vinyl in colours of your choice. 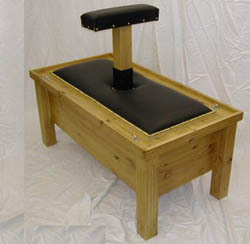 This quality hand made piece of furniture is barrel shaped. 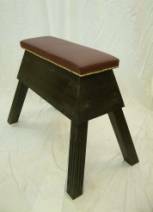 A very sturdy comfortable piece. Optional extra fittings can come in brass or stainless steel. A quality piece made with high grade leather and stud work. The wood comes in a variety of colours. Fittings optional extras, stainless steel. This very sturdy kneeling bench, finished in red vinyl, although large when in use, folds easily to storage size. Straps and stainless steel fittings are included in final price. Leather finish if required is an optional extra. Leather and vinyl come in a variety of colours. 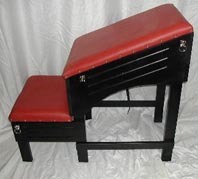 Here is another version of the kneeling bench, finished in red vinyl, folds easily to storage size. Stainless steel fittings are included in final price. Leather finish if required is an optional extra. Leather and vinyl come in a variety of colours. Leather upholstery in a variety of colours. Ankle, Calf , Thigh and Waist leather straps. Stainless steel retraining rings. Cutaway for genital access. This substantial quality hand made coffee table is perfect for players with limited space. 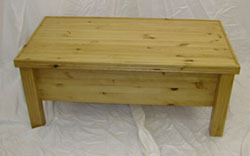 A lovely piece of pine furniture for your living room which easily converts to a kneeling bench when the table-top is reversed. 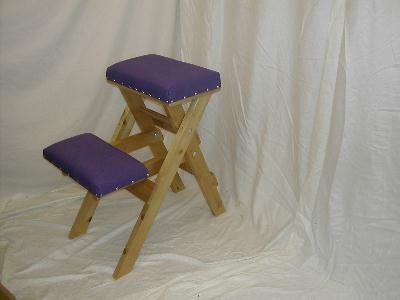 Leather studded bench top available in a choice of colours. Plenty of storage room in the large table base for your other play toys too. 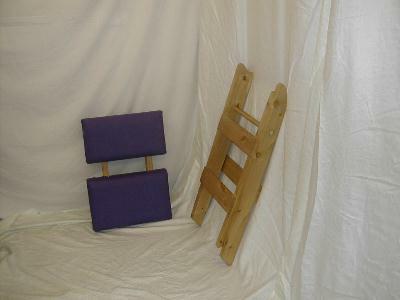 Small, very portable and folds easily for storage or pack for that naughty spanking weekend away. Wood and Vinyl come in a choice of colours.